Day 332: Prayers for Luke . . .
As we go about our busy lives, we often times don’t stop and take enough time to appreciate what we have . . . each other, our daughters, our faith, our extended family, good friends and our health. To be honest , most of these things we just take for granted and never give a second thought. Tonight we want to stop and pause for a moment or two (or 400 words or less if you are a blogger!) and just count our lucky stars. During our almost 54 years we have come across all kinds of people – some whom we relish and some we just tolerate because it’s the right thing to do. But, we have to admit there is a young fella named Luke – who while we know a bit . . . mostly through his parents . . . we think is a shining example for all of us. Luke was born premature and from what we know has faced more obstacles in his short 3+ years than most of us will face in a lifetime. His medical issues have ranged from grandiose to not so grandiose – but challenges nonetheless. Every, and we mean EVERY time we’ve come in contact with him, we have been gifted a shy smile and an eye twinkle that melts our hearts. This young man is just contagious – not a water-walker mind you, but contagious in his joy of life . . . while most likely way too young to totally comprehend what he has faced – he lives life to the fullest. With four older siblings to lead and guide him, this remarkable person named Luke has taken life by storm. Tonight we dedicate this post to Luke as he prepares to undergo some very tough surgery on Wednesday. Part of his health challenges include the need to do some major surgery on his skull . . . so, we ask that each of you take a moment or two on Wednesday morning and say a prayer for Luke to come through with flying colors. Pray for his parents to be at peace during the surgery and place complete trust in the capable hands of the surgeons whom our Heavenly Father has placed on this earth to perform such medical procedures. Pray for his brothers and sisters as they anxiously await word on their brother whom they love, dote on and care deeply about – finally, pray for all those who will provide before, during and aftercare for Luke – he will need their attention and skill. Tonight, after a busy day for Jean helping D#1 move into her classroom and then search for a place to live in Austin and a busy day for Brian videotaping “San Marcos Shining Stars” for his upcoming Chamber business expo, we opened a little wine we found during our “work weekend” in Kerrville for less than $12. 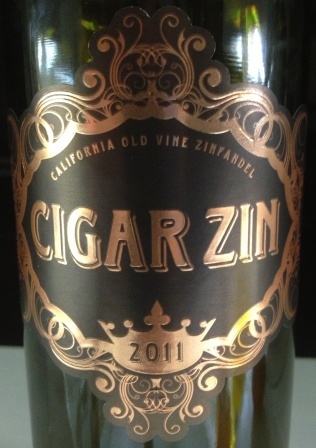 We opened a 2011 Cigar Zin . . . their motto is “grab life by the bottle” – interesting theme . . . and interesting flavor. In the glass – its’ color was medium body, a little thin on the ruby-red side but a pretty sight to behold. On the nose, this little gem was classic Zin – peppery, spicy and lots of dark fruit. On the palate, really . . . really fruity with less spice than on the nose, but a fruit bomb nonetheless. It’s a blend of 90% Zinfandel, 5% Petite Sirah, 5% Syrah . . . WOW, what a combination! This wine was also hand harvested at peak season to ensure quality and flavor, the fruit for Cigar Zin was sorted then fermented for 7 days then prepared the wine in French (50%) and American (50%) oak barrels for 11 months. No wonder its soooo good! We will add this one to the Bondy Deck Wine list and am thinking it could make the Top Ten list (well, maybe the Top 20). Thank you for being out there – thank you for reading our blog – and most importantly tonight, thank you for praying with us for Luke. Have a great night and remember to enjoy responsibly and recycle whenever possible. Categories: Uncategorized | Tags: Kerrville, luke, Petite Syrah, San Marcos, Sirah, Zinfandel | Permalink.